What Does it Mean to be “Cross Utilized”? 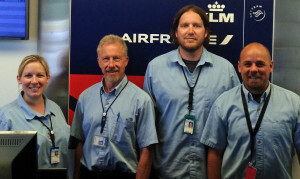 SkyWest’s cross utilized agents have a lot of responsibilities. In one shift, they’ll help passengers check in, get them boarded onto flights, ensure their bags are loaded and much more. Amy Orsini, who is based in West Yellowstone, Mont., gives some insight into what it’s like to be a cross utilized agent. Why did you decide to apply at SkyWest? I was working at a restaurant and a coworker saw an ad in the paper for ramp, customer service agents and flight attendants and said let’s go to this recruiting event. I had never considered working for an airline but thought I would give it a shot. At the recruiting event, I applied for Customer Service in Salt Lake City. Best decision of my life! Amy and some of the West Yellowstone, MT (WYS) team. What’s something people might not know about being a cross utilized agent? We do EVERYTHING. We work the ticket counter, the gate, out on the ramp, clean the planes and de-ice! You could check in a passenger, then load their bag and board them on the plane. You gain a lot of knowledge about how the airline operates. A typical day as a cross utilized agent starts out when we check the bookings for our flights, inspect the ground equipment and set up for arrivals and departures. Then we start to check in passengers. Getting to see different state’s IDs or country’s passports is cool, and customer service is important while checking in our passengers and their luggage. Interacting with them to find out if they are on vacation or if this is a business trip and what their destination is makes the day interesting. 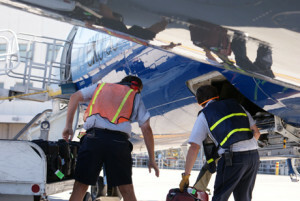 When the flight arrives, we go out to the aircraft to unload passengers and bags, say hello to the flight crew, and then load up our outbound passengers and their bags. Once that flight is ready and on its way, we head back inside to check in passengers for the next flight. Agents loading baggage onto aircraft. You’ve been at SkyWest for 14 years now, what has made you stay? I have stayed because I love this company! The opportunities working here seem endless and there is always movement if I want to change my career path. I also love the relationships I’ve developed with people all over the company. Communication is easy and important for SkyWest. The fact that I can send a note to the vice president of Customer Service and get a response quickly, directly from him, along with people from any department means a lot! Although we are a growing company it still feels like a family. I also love the challenge of working for the airline, the fast-paced environment, flexible schedules and, of course, the amazing travel privileges. 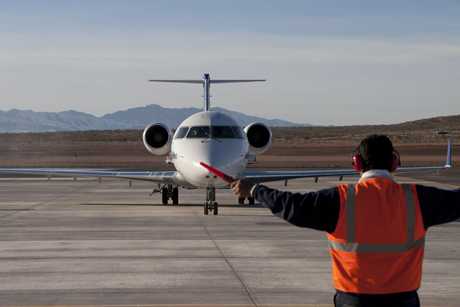 Agent marshaling aircraft at St. George, Utah Airport. The versatility and problem solving that each day requires. I get to use my computer skills while booking/rebooking passengers, my problem solving skills when there is a delay and to load plan (weight and balance of the aircraft). I love the knowledge I’ve gained for the whole operation. I also enjoy the fresh air while marshaling in an aircraft, unloading bags and driving around the tarmac. And I get to do all of this with an awesome team! What qualities or skills help make someone a good cross utilized agent? Being people oriented, flexible, able to solve problems, and someone who loves to travel! What advice would you give someone who is interested in becoming a cross utilized agent? Be sure you like planes, passengers, a little bit of physical labor and are flexible! This is not a typical 9-5 kind of job. The airport never has a day off; planes and people are always traveling. If you like change, a fast-paced environment and are flexible this is the job for you!